If you child proof your home to keep your kids safe, why shouldn’t you senior dog proof it to keep them safe! Let me start by saying…just because your dog has reached the “number” where he is now referred to as “senior” doesn’t mean he isn’t still jumping around, high energy and as fit as ever. If he is that’s amazing, but if he’s slowing down a bit, has a touch of arthritis, or maybe some vision problems, you’ll want to make your home as safe as possible. Here are my 7 ways to do just that! Sometimes the floor is not as clutter free as we may like, so here’s a reason to get everyone picking up after themselves. Your dog may not see the toy on the floor as clearly as before, be able to climb over it or navigate around it. A dropped coin, button or other small object may be mistaken for a treat. Best to keep your floors clutter free and avoid the risk of accident or injury. By all means re-decorate, but if you never had a table in the middle of the room, now may not be the time to add one. Has it become more challenging for your dog to get into the car, onto the couch, or into your bed? Do you have mobility issues that make it difficult to lift your small dog? Is your dog too big to lift without help? Give him back his freedom by investing in a dog ramp or pet stairs. He will be able to get onto the couch or bed without you keeping a constant eye on him, worried he may jump or fall and injure himself. 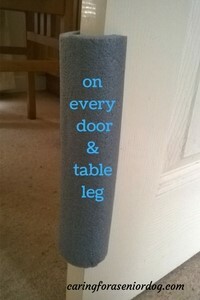 With some vision loss or confusion you may find your dog bumping into things, and boy can that wrought iron table leg or corner cabinet hurt! Either move them a bit out of the way, and for those things that cannot be moved, some padding at your dog’s head level should help. Baby gates will become your new best friend, and are the perfect way to block off access to stairs. Not only might it be difficult to climb them, he may stumble and fall on the way down. Just make sure his bed, food and water bowls are all easily accessible on whichever level your dog is. Dogs of all ages can find flooring like tile, linoleum and the like challenging to walk on. In fact it can be almost impossible to grip, something that can be more problematic for older dogs, especially if they’re less sure footed then they once were. Some area rugs with a non-skid mat underneath will be a big help. I know this one sounds really brutal, but I am particularly conscious about things like cords from horizontal blinds, televisions and lamps. A dog suffering partial or total vision loss, or may be confused by dementia could easily lie down close to any of these hazards, fall asleep and accidentally be strangled. I tuck all cords out of reach as a precaution. 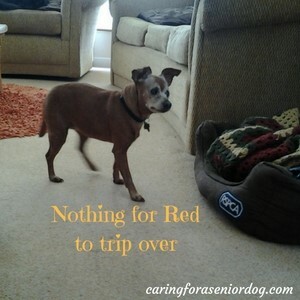 My number one priority in caring for my senior dog Red, is to do everything I possibly can to keep her happy, healthy and safe. I am hyper aware of her surroundings and never take chances. She’s blind so I have to be even more vigilant. I do hope these 7 easy ways to senior dog proof your home have been helpful, and given you some ideas of how to make yours as safe as possible for your furry companion. This post was written by author Hindy Pearson. She is a long time shelter volunteer, dog trainer, and runs the Saffy Pearson Resource Centre. A mobile centre offering free advice for people who share their lives with cats and dogs. She has a website called Caring For a Senior Dog and thinks the pet stroller is the greatest invention. Gizmo May Be Slowing Down, But He is Fearless! Previous How to Make Your Cat and Dog Friends! Next Can My Dog Look Like a Show Dog?